Many years ago, a friend and I had traveled to the eastern shores of Maryland to do some bird watching. We stopped at what looked like a small unimpressive restaurant. Calling myself adventerous to try a dish I had never eaten before, I ordered a blackened tuna steak. At first bite, I was in love! And frankly after that experience, for me, no other "up scale" restaurant could make a better blackened tuna steak. 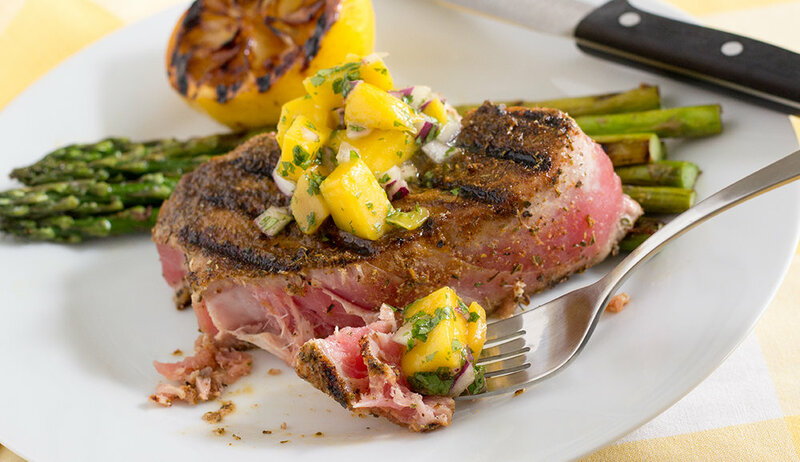 This recipe is how I now make blackened tuna steak at home, now that I'm far away from the tiny unimpressive restaurant on the eastern shores of Maryland. 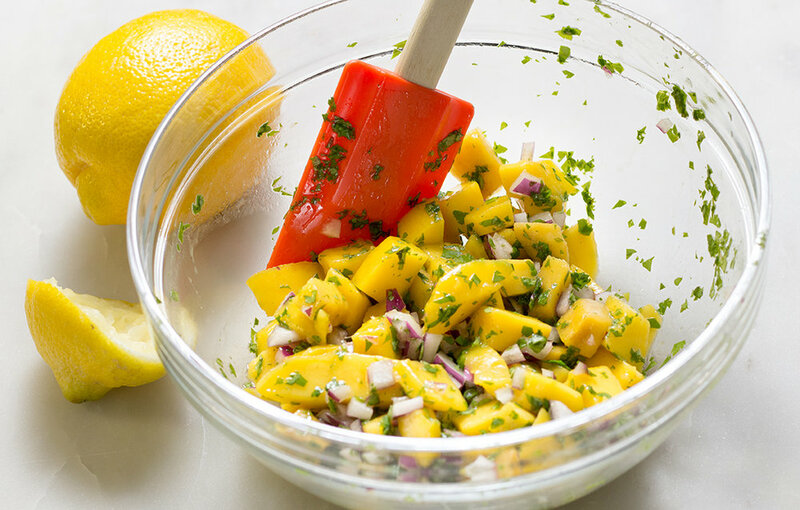 Here, I've added a chilled mango salsa that wonderfully complements the spicy blackened seasoning. The tuna is moist and tender, its flavor stands up admirably against the spice and sweetness. This is one dish where I literally close my eyes and joyfully moan "hummm, so good." — Diana Rattray, "Blackened Seasoning"
When there simply isn't the time or interest, purchase the seasoning already made. Or you can be ambitious, follow Ms. Rattray's advice and make your own. Basic ingredients include the following: paprika, garlic powder, onion powder, thyme, black pepper, cayenne pepper, basil, and oregano which you may already have stored in your kitchen cabinet. 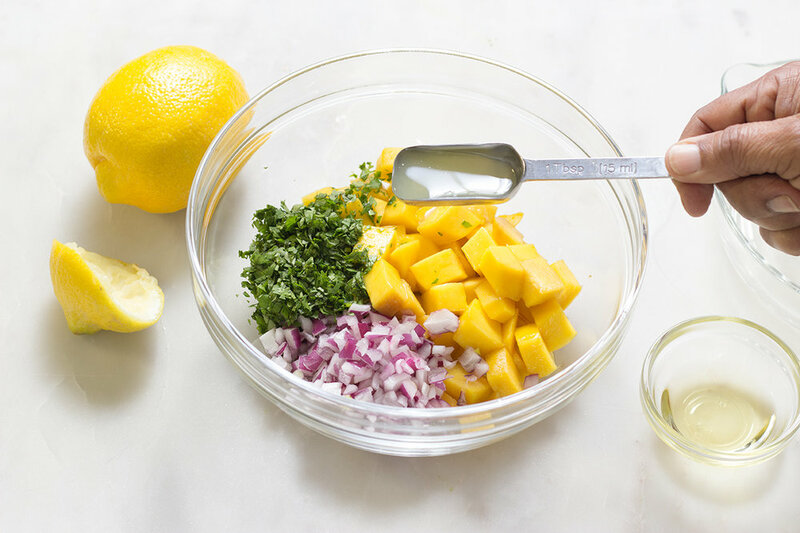 Add lemon juice and zest to chopped mango, cilantro and red onions. Salt and white pepper to taste. Mix well. Chill in refrigerator for at least one hour. Wash, pat dry, then brush olive oil on tuna steaks. 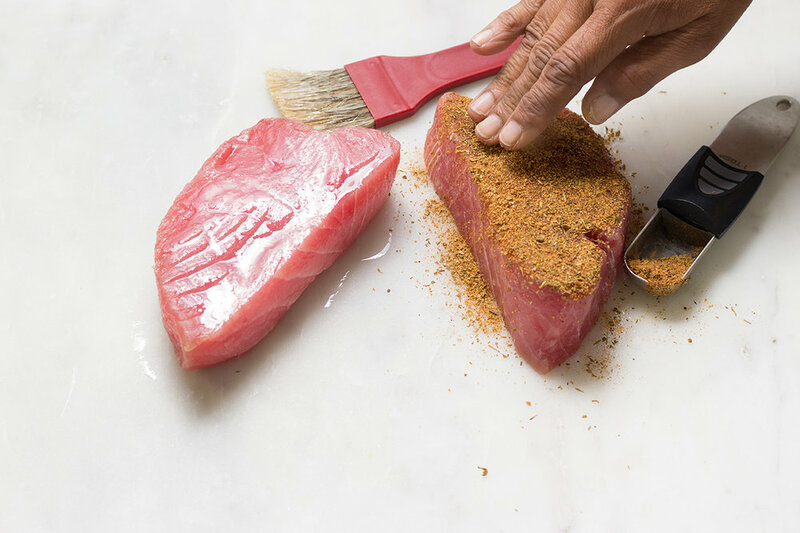 Thoroughly coat top and bottom of tuna steaks with blackened seasoning. Set aside in refrigerator. Brush olive oil on asparagus, season with salt & pepper. Add asparagus to center of a very hot grill pan. Cook for 4 minutes on one side. Grill cut lemons (optional). Turn over asparagus and push to sides. 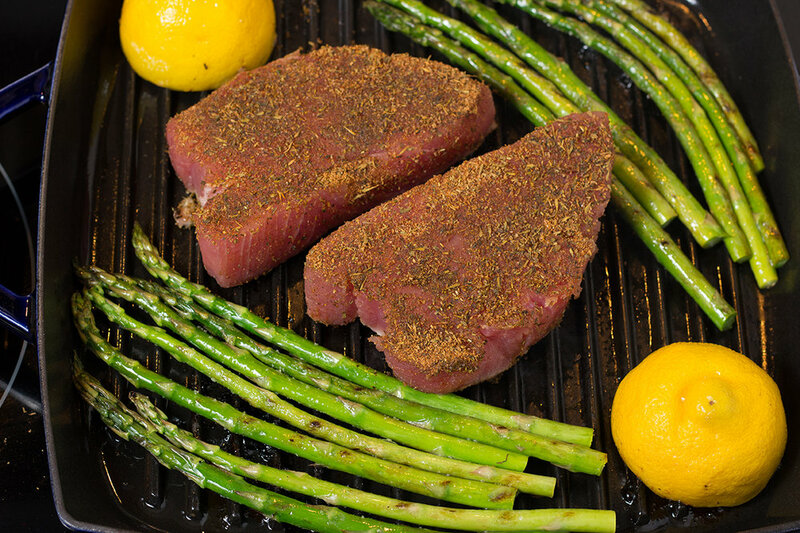 Add tuna steaks to the center of the grill pan. Grill steaks for TWO minutes on one side. Turn them over and cook for TWO minutes. 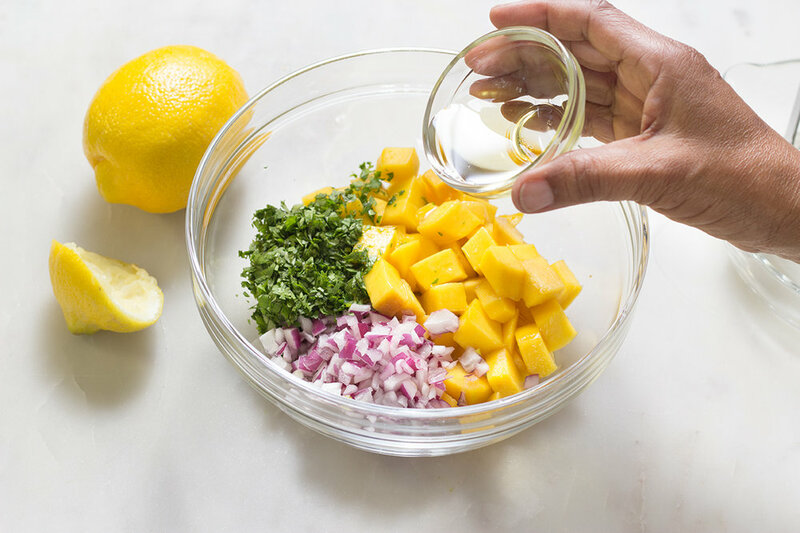 Mix all ingredients and chill in the refrigerator for at least one hour. 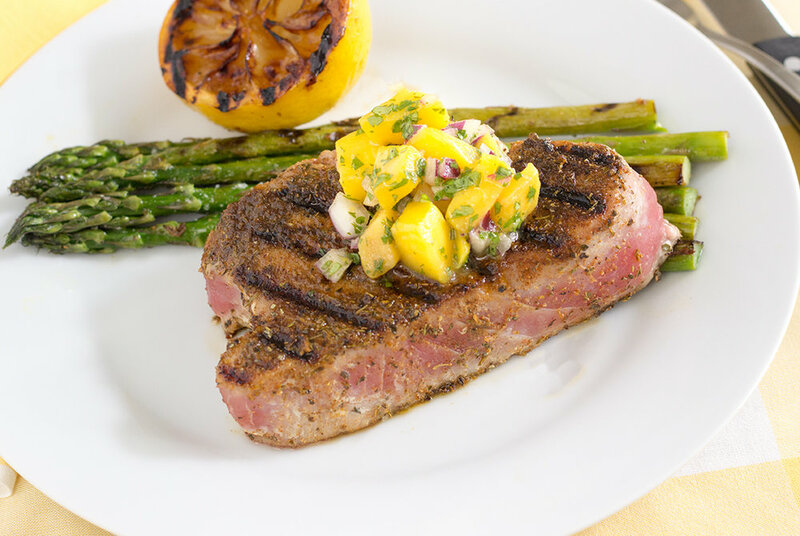 While mango salsa is chilling, prep tuna steaks. At this point, brush the cast-iron grill pan with olive oil, set cooking element temperature to a medium-low heat, slowly bringing the grill to a high heat (about 8-10 minutes). If you are using an outdoor grill, start the heating process and make sure there is someone to "man" the grill! Wash steaks and pat dry. Brush olive oil on one side. Heavily sprinkle top with blacked seasoning, using 1 tablespoon. Turn steaks over and repeat with olive oil and seasoning. Set steaks aside in the refrigerator. For each serving, allow 7-9 spears. Cut off about 1/2" of the root tips. Wash and pat dry. Brush will extra-virgin olive oil on all sides and season with salt and white pepper. Transfer asparagus to the hottest part of the grill (usually the center for a stove-top grill pan). Add cut lemons to the edge, if you are grilling lemons as well. Cook for 4 minutes. Turn over, push spears to the outter edge of the grill pan to make room for the steaks. 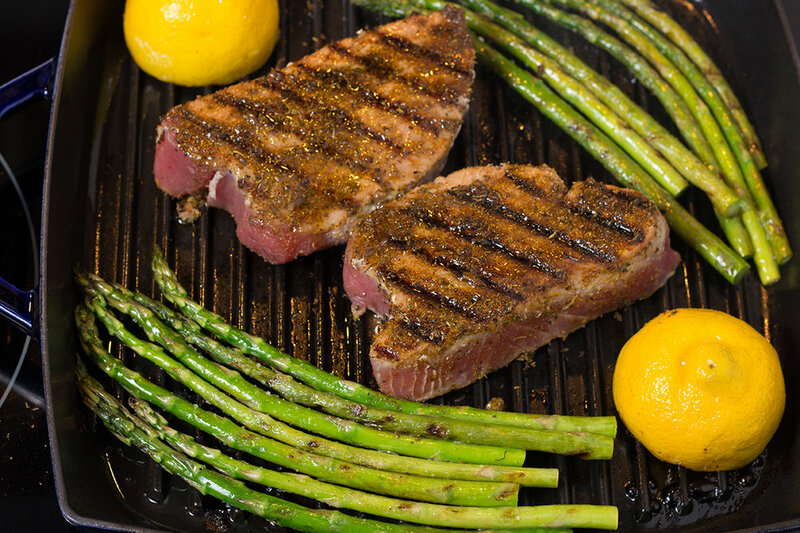 Remove tuna steaks from the fridge and place on grill, the hottest part. Cook the first side for 2 minutes. Turn over and brush with a little olive oil on top of the cooked side. Cook the second side for 2 minutes. Results should be a blackened top with steak edges cooked to about 1/4 inch. Do not overcook or you will end up with a dry, flaky tuna steak that taste more like chicken! If using a stove-top grilled pan, brush it with 100% olive oil (not virgin olive oil which burns at a high temperature). Slowly bring the grill pan to very hot, you should see a little smoke emitting from the pan. If you are using a gas or charcoal grill, allow the grill rack to become very hot. 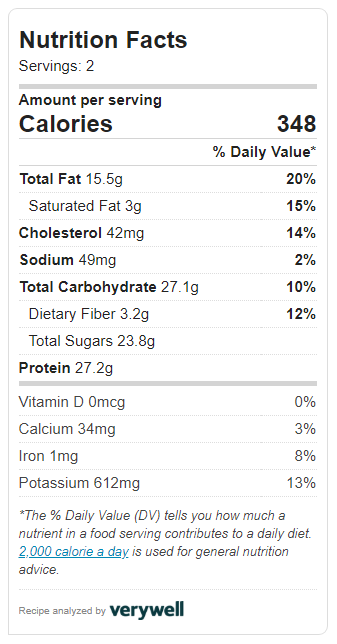 This is an estimated nutritional value for the tuna steak and mango salsa. Estimate does not include salt.